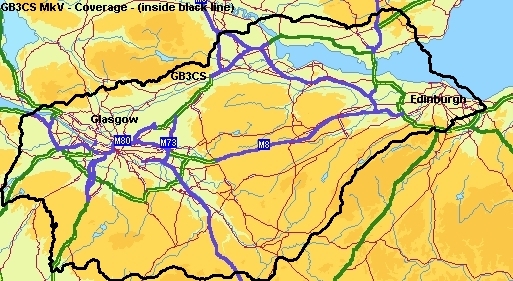 In a previous edition of FM NEWS we started a repeater of the month column with GB3DM (RB9 433.225/434.825) - Then Scotland�s newest voice repeater. Though not a CSFMG repeater anyone using this repeater will notice that it sounds very similar to other CSMFG repeaters! The idea of the column is to promote not just our own repeaters but to provide information on other Scottish repeaters: history, operational status, access, who runs the repeater and if possible a coverage map, etc. In line with this thinking and as DM had just come on we thought it appropriate to publicise as much info on the new repeater. Now back to our own kin! I thought we would start the format off with the flagship of the group GB3CS which as some of our older or not so old members may remember has had an interesting history. Dipping into GM3KMG�s article in Issue 100 of FM NEWS "GB3CS - The First Five Years" Dave will set the background to creation of CS. (1976) ...... several repeaters were operational south of the border and local amateurs were getting somewhat agitated, to say the least, by the lack of progress. This despite an antenna having been mounted on the mast. Because of my position at Blackhill as technical manager I had offered assistance from day one in "the ham spirit" even though my main interest was HF. ..... The new committee now had work to do! They had promised to get a repeater operational within two weeks. We made it, thanks to some great and frantic team work. We even got a transmitter working in beacon mode after a week. This gave a useful indication of the repeater coverage and really whetted the appetites. All quite an achievement, but if anyone should be "mentioned in dispatches" it must be Sim, GM3SAN. 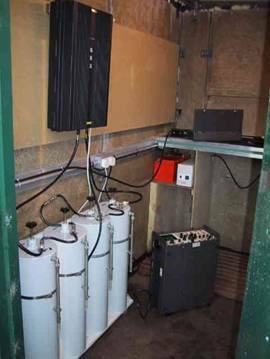 He had already developed and constructed a logic unit for the West Central Scotland UHF Repeater Group. This was generously made available. Through his association with Lowe's, reliable transmitter and receiver modules were donated by "Bandit Bill". So GB3CS was born. The long wait and the novelty of the device made for frantic activity for the first few days. There was even more excitement when the band opened to LA's for a few hours at this time. This was not a fit and forget situation with the committee resting on its laurels. There was work to he done! It was reported that the radiation was predominantly horizontally polarized and because of feeder losses the e.r.p. was only about one watt. Despite that, we were getting amazing coverage - but an antenna height of 140m on a site at 300m does help! ..... As with any with radio station, the antenna is make or break in the efficiency of a repeater. By the end of the year a highly efficient system had been installed. This comprised the ground plane used as a receive antenna with a highly selective head amplifier, an Andrews 24ft long co- linear at 120m and a 5 element yagi at 52m as transmit antennas. The yagi was fed with a fifth of the power from a home made coupler and was necessary to fill in a null towards Glasgow caused by the close mounting of the co-linear to the mast. We were really lucky to have Dave, GM3OLK as an Andrews contact. How else could we have got all that surplus feeder and two commercial co-linears (one spare!) at a price any Aberdonian would break his heart for? Dave and fellow Fifer Drew, GM3YOR, also did tremendous work up the mast. 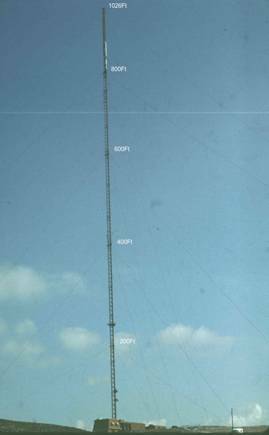 Imagine climbing over 30Oft up a thin vertical ladder and then having hang on and fit an antenna so it would stay there through all the vicious weather you get at that height. ..... So within the first year a top class repeater was at last in operation in Scotland. What few outages we had were quickly fixed, although some annoyance was expressed by users when we were "fiddling about" with the repeater. We were trying to improve things - honest! 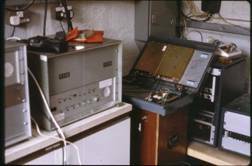 GB3CS MkII utilised the same discrete logic but was interfaced with a Storno CQF base station. This base had been earmarked for GB3FF at Craigkelly but was not used. GB3CS MKIV. Late 1994 saw the replacement of CS MkIII with a new high power repeater, Wacom duplexer, MuTec pre-amp, ctcss and previously installed 6502 logic and voice ident system of Mklll. Coming up to the present. Following the sell-off of the IBA sites to NTL in the early nineties it was inevitable that CS would have to move from Blackhill and this happened in the late Summer of 1999. Interestingly moving to an old commercial site above Kilsyth, which I used to maintain as a young field engineer. GB3CS MkV. A year after the move to the new site it was decided to standardise CS to the same build and logic standard as the other CSMFG repeaters. However there was problems interfacing the logic. It was decided to try a new logic developed by Peter GM0MUO which is why you will notice the different format to the logic flow of the other repeaters. GB3CS MkVI will be one of the new generation of repeaters at present being developed to replace our existing repeaters. It is expected to come into service in early 2004. 6 mins if not in use or 12 mins if in use. but no greater than 4 secs or 103.5Hz CTCSS.